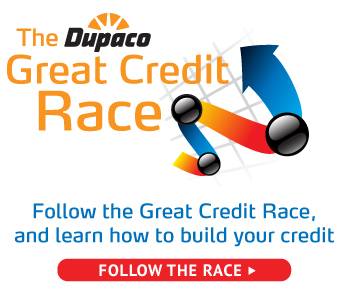 Dupaco’s Great Credit Race is just beginning, and the racers are strategizing how to quickly establish a solid credit score. All 14 participants received a Dupaco Visa credit card with a $1,000 limit and one-on-one credit coaching before the six-month credit-building competition kicked off May 1. Now, it’s up to the racers to apply what they’ve learned and start building their credit score from 0 to as high as possible. When it comes to using their first credit card, the racers are already employing different strategies. Racer Brett B. (left), of Hiawatha, Iowa, has started the race with a conservative spending approach—using his card the first time to purchase ice cream. He hasn’t used his Visa since. Fellow racer Jack S. (left), of Waterloo, Iowa, says his credit card came in handy during a recent vacation in Florida, where he used it multiple times for small purchases. In addition to the credit coaching he receives through the race, Jack S. says he’s also receiving guidance at home. “My mom keeps telling me, ‘Make sure you pay it off,’” he says. Before this competition, both teens say they were already interested in learning how to build their credit to help them qualify for loans down the road. When they learned about the race—and the opportunity to win $1,000 for having the highest score—they were all in.